Based on one of the most revered science fiction novels, the film's protagonist is sent to an alien planet that is hosting its own middle ages now; the protagonist is bound to the proviso to not interfere with the proceedings on that planet where he is received as a God but can't actually do nothing. 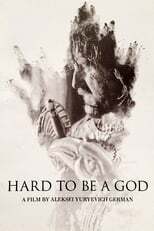 Hard to be a God is directed by Aleksey German and was released on Feb 27th, 2014. Director Aleksey German's Drama & Science Fiction movie Hard to be a God is produced by Sever Studio & Russia 1 & was released 2013-02-27.